You'll have professional record keeping and easy reference when you use the Telephone Log. You can select a patient, quickly review the logs of previous calls, and see a quick summary in the list, or click on a call to display it in full detail. Enhance your marketing efforts at virtually no cost. You can provide your patient with thank you letters or educational letters as they leave the front desk. We've even provided you with some merge-letter templates to get you started. All Patient Immediate Letters are fully customizable to your office. You can easily see letters you've already given to a patient. ChiroOffice provides you with popup messages. Just click your left toolbar under Miscellaneous, and you can enter your popup message. 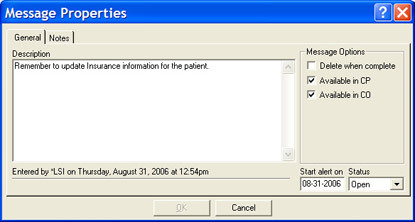 A patient can have more than one popup message, and each can be "completed" individually. 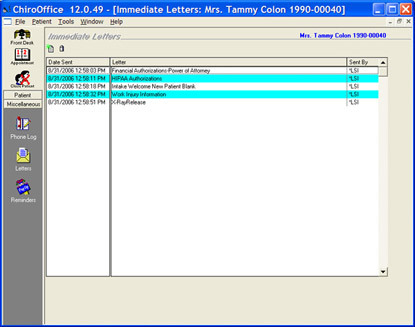 Popop messages display when you select a patient and when you checkout a patient. The purpose is for the popup reminder to be displayed when the patient is present. For messages that are related to date/time alarms, see the "Projects" section. This window lets you quickly add a project, whether a "to do" or a phone call or more. You can associate it with a popup alarm if you like. 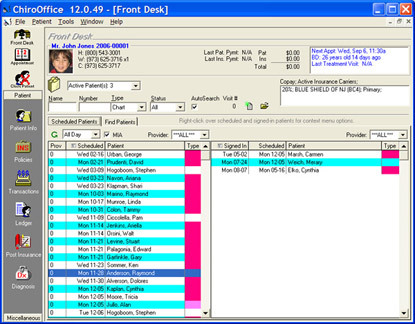 Projects can be associated with a specific patient, or can be a general office task. All projects created are viewed in the Project Organizer accessible through the Tools menu.